Launch feedback is the method that KDE uses to let you know that something is happening when you start a new program. It may sometimes take a minute or two (or more if you have a slow computer) to launch a program, especially a large one. During that time you might be left to wonder, “is anything really happening? Should I click the icon to start this program again?” The basic answer is that you don’t know what is happening, but that you should not click the icon again. 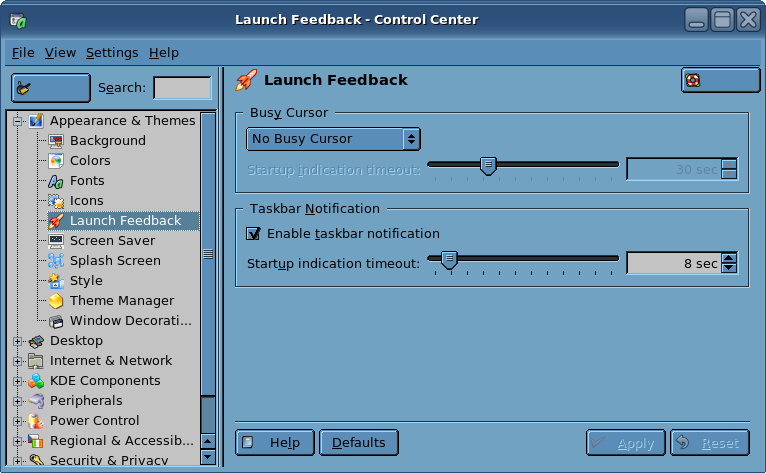 Figure 29: This page of the Control Center gives you control over the type of feedback you get when launching a program. In order to deal with this situation, KDE provides visual feedback that allows you to see that something is really happening. The default is for the “Busy Cursor,” and animated cursor with a bouncing fedora hat or Fedora “Infinity” icon to visually indicate that the program is loading. In addition, the button for the new program that appears in the Taskbar shows an hourglass. The options you have on the Launch Feedback page of the Control Center are to turn the Busy Cursor off and to disable Taskbar notification, as well as to specify the amount of time each is active when a program is launched. You can also set the cursor to blink instead of bounce, or to provide more passive feedback. I find all of this type of feedback to be annoying and obtrusive, so, as you can see by Figure 29, I turn it all off. You may find this valuable feedback, so you should experiment with these settings until they meet your needs. Your settings can always be changed later, or reset to the defaults using the Defaults button on this page.